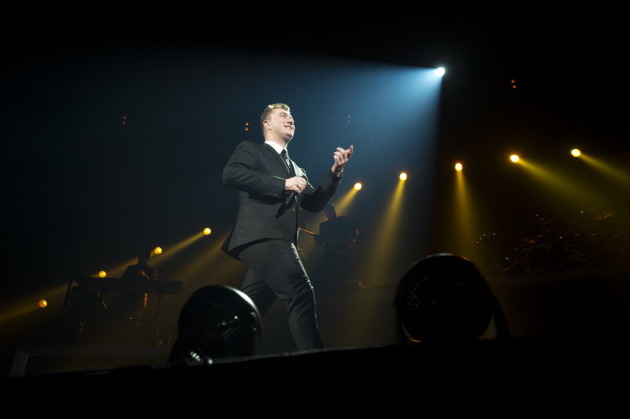 Even though he made his big splash on “Saturday Night Live” last year, Sam Smith demonstrated Saturday night in his Twin Cities debut that he’s not quite ready for primetime in concert. It’s challenging to present a bigtime headline concert when you’ve got only one album of material. And at Roy Wilkins Auditorium, the British pop star delivered almost all the tracks on the deluxe version of his best-selling, Grammy-nominated“In the Lonely Hour” plus a dramatic cover of the standard “My Funny Valentine” and the one-dimensional “Together,” a 2014 collaboration with the British electronic duo Disclosure and Nile Rodgers. As my review pointed out, his repertoire suffers from sonic sameness because it’s so heavy on ballads and mid-tempo tunes. Even his reading of “Latch,” the Disclosure dance hit on which he was the featured singer, was more downtempo than the original. Smith made an obtuse reference to playing to only 20 people the first time in Minneapolis. That was actually a private performance last March at the Dakota Jazz Club for key employees of Target and Best Buy as well as radio programmers.